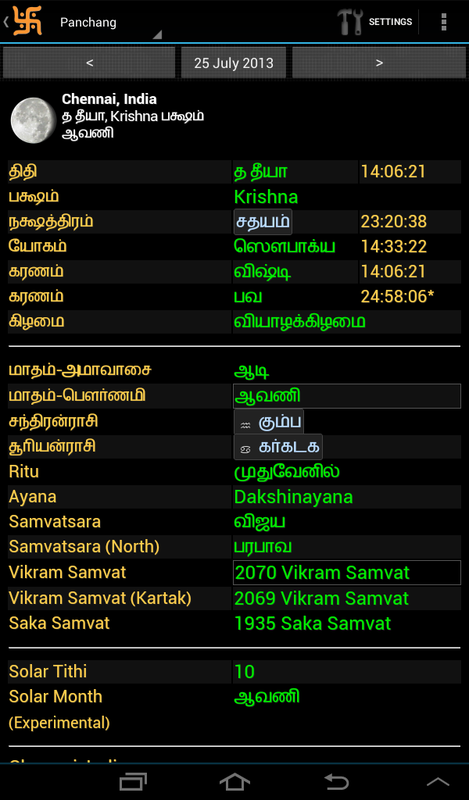 Hindu Calendar: New Languages in the latest version!! New Languages in the latest version!! Beta version of Tamil, Telugu, Kannada. Thanks to contributors. Will not work on all devices. Contribute to the translations at http://goo.gl/D9GAJ . Ganda Mool and Panchak added in Jyotish section, Thanks to Ramesh Chouhan. Added Samvatsara names for North. Thanks to Tek Chand Ji and others. Shortening planet name in Kundali. Bug on device rotation, minor spelling mistakes fixed, added cities. Attempting changes to allow year selection before 1980 for some devices.